With the CliniMACS Prodigy® T Cell Transduction Process you can now generate gene-modified T cells in a simple and fully automated fashion. Easy to use, this unique process will surely change the way you work. Chimeric antigen receptor (CAR) T cell therapy is undoubtedly leading a revolution in cancer therapy1,2. The recent successes of CAR T cell therapy in fighting hematologic malignancies have led to a tremendous increase in interest in the immunotherapeutic field³. The great potential of genetically modified T cells now even expands into the area of solid tumors and infectious diseases⁴. Currently, the manufacturing process of engineered T cells consists of various complex procedures, is labor intensive, and represents one of the biggest challenges in this area. 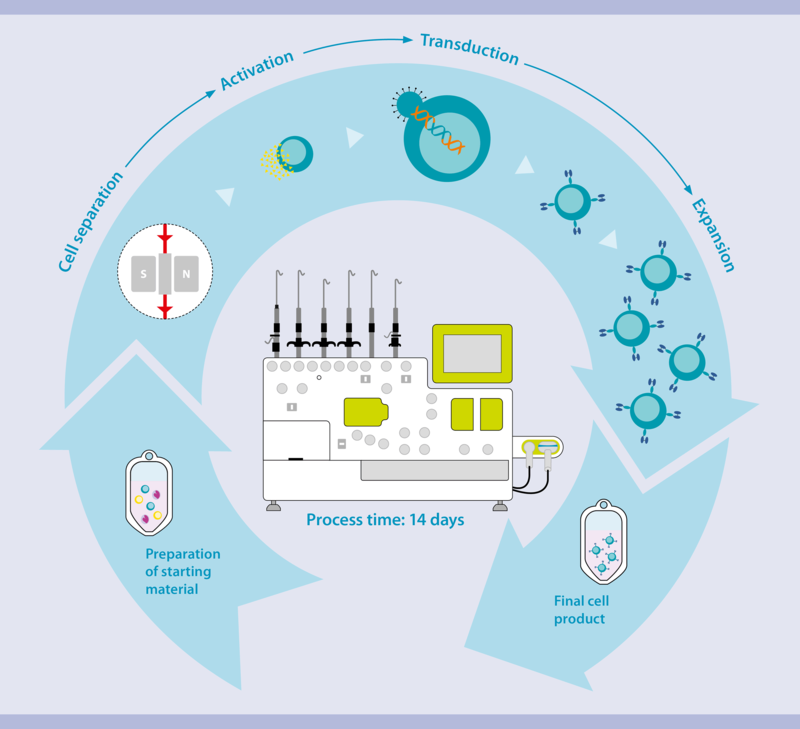 The CliniMACS Prodigy T cell transduction (TCT) process provides a unique all-in-one solution to these challenges. With the CliniMACS Prodigy Platform it is possible to generate gene-modified T cells in a standardized and fully automated process. 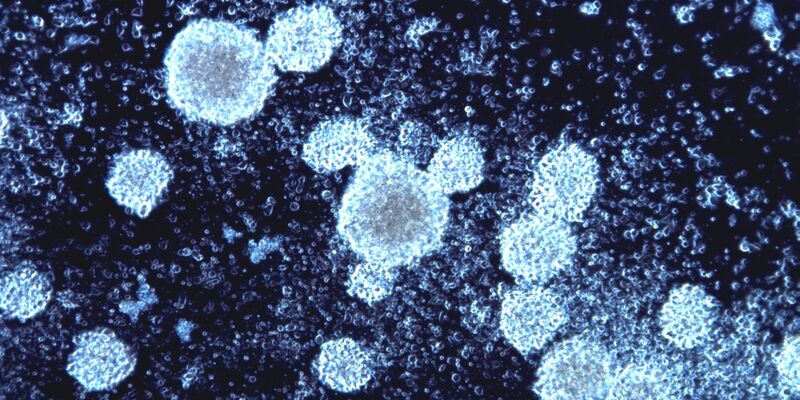 It is a breakthrough in cell manufacturing, a leap to the next generation. With the CliniMACS Prodigy T Cell Transduction Process you can now generate gene-modified T cells in a simple and fully automated way. Easy to use, this unique process will surely change the way you work. The CliniMACS Prodigy Platform enables the entire workflow for the manufacture of CAR T cells, from T cell selection through to cell formulation. Importantly, all cell processing steps are completely automated, ensuring a highly reproducible and standardized manufacturing process. During the TCT process, T cells are enriched by specific selection on day 0 (D0) and then activated overnight. On D1 T cells are transduced with a (lentiviral) vector. Subsequently, transduced T cells are expanded to the desired cell number for final cell formulation (D10–14). For the manufacture and use of gene-engineered T cells, national and international legislation and regulations must be followed. Miltenyi Biotec as the provider of products for the TCT process does not give any recommendation regarding the use of the manufactured cells for therapeutic purposes and does not make any claim regarding a clinical benefit. MACS GMP T Cell TransAct™ has been designed to activate and expand enriched T cell populations or human resting T cells from peripheral blood mononuclear cells (PBMCs). The reagent can be sterile filtered, and excess reagent can conveniently be removed by washing. MACS GMP T Cell TransAct is directly applicable for the use in automated culture systems, such as the CliniMACS Prodigy Instrument. T cells activated with MACS GMP T Cell TransAct. Enriched CD4+ and CD8+ T cells from a melanoma patient were enriched and activated using MACS GMP T Cell TransAct and cultured in TexMACS GMP Medium supplemented with IL-7 and IL-15. Pictures were taken with the integrated microscope camera of the CliniMACS Prodigy, 72 hours after activation. For EU: Please check with your regulatory authority for specific guidance on your investigational product. For US: Unless otherwise indicated, Lentigen products are for research and investigational use, only. Investigational use is allowed under approved IND-application, only. Anurathapan, U. et al. (2014) Cytotherapy 16: 713–733. Maus, M.V. et al. (2014) Blood 123: 2625–2635. Barrett, D.M. et al. (2015) J. Immunol. 195: 755–761. Whilding, L.M. and Maher, J. (2015) Mol. Oncol. 9: 1994–2018. Mock, U. et al. (2016) Cytotherapy 18: 1002–1011. Priesner, C. et al. (2016) Hum. Gene Ther. 27: 860–869.